As a Subaru enthusiast who came of age in the 90’s, I have a more than healthy appreciation for the EJ Era offerings of the brand. My first time driving a Subaru was actually test driving a 2001 RS. So having the opportunity recently to photograph some of NFSG’s (and TBF’s) finest GC Impreza has been a real joy. September’s NFSG Featured Ride, Matt Larkin’s 2000 RS sedan is one of my favorites to date and, I’m not afraid to say, exactly how I’d do it if I had one of my own. We met up on a deserted stretch of road with storm clouds moving in, so I could capture the wonder of this red RS that is just beautiful enough from the factory. Growing up in Colorado, Matt says, everyone had either a Subaru or a Jeep. True to his roots, in Matt’s garage there are the RS and a lifted XJ Jeep Cherokee. A Ford F-350 pickup and his wife’s 2008 WRX also fight for room. His first car was a luxurious 1995 Lexus ES300 and from there the most notable of the past cars include a 1994 Integra GSR. It wasn’t until 2008, however that Matt saw the light - from the Pleiades, presumably. On a leave back home in Denver, he caught the bug from his best friend’s 1999 RS coupe. In February 2010, Matt found the stock Sedona Red sedan in Boston. He flew up to collect it, looking forward to years of reliably daily driving of his first Subaru. Around 500 miles into the trip south, however the bullet-proof NA mill threw a rod. 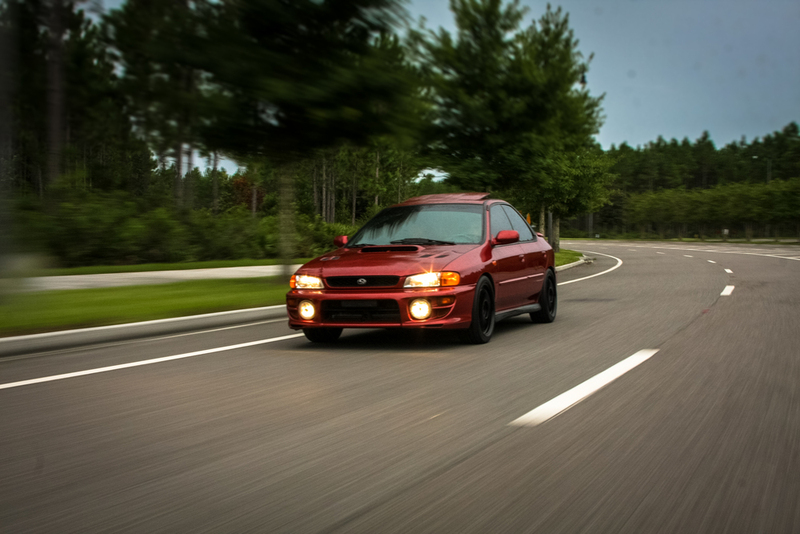 That adventure paved the way for the car’s first series of modifications - an EJ255 swapped from a 2006 WRX. In the years since, every upgrade has been done with an emphasis on functionality and performance. What you can see from the pictures is one of Matt’s favorite things, this is a pretty stock looking car. Subtle touches like JDM tail lights, amber corner lights, a “Subaru” branded bumper guard add some personalization, but the whole package belie the RS’s true nature. Sure, it’s doesn’t take much scrutiny to notice Enkie RPF1 and that the ride height is lower than stock, courtesy of ST Coilovers. But what takes closer inspection to realize it that the stock brakes have been ditched in favor of 1993 300ZX calipers (4-pot fronts and 2-pot rears, supported by aftermarket caliper brackets) which squeeze Legacy GT front rotors, 2006 WRX rotors out back. Even more discrete modifications to the steering and suspension maximize grip and serve to fix rust issues caused by ten northern winters. Getting a look at the 2003 WRX rear subframe, GD STI rear swaybar and endlinks, JDM GD STI rear lateral links with Group N pillowballs, and 2006 WRX subframe and swaybar in the front would require getting under the car. Like the suspension, the engine and driveline have received a thorough massaging; our pristine North Florida air passes through an HKS intake to a Perrin inlet. An IHI VF48 (the stock turbo on the 08+ STI) supplies plenty of whooshing black magic - compressing the intake charge to the pressure specified by the Grimmspeed Manual Boost Controller and forcing it through the GD sourced STI Intercooler, TGV deletes and into the block. Fuel is added to the combustible mixture by ID1000 injectors and kept at adequate pressure by a DW200 fuel pump. Huffing back through the hot side of the turbo, exhaust gasses flow through an Invidia Downpipe and N1 catback, which makes the deep rumble that we all know and love. 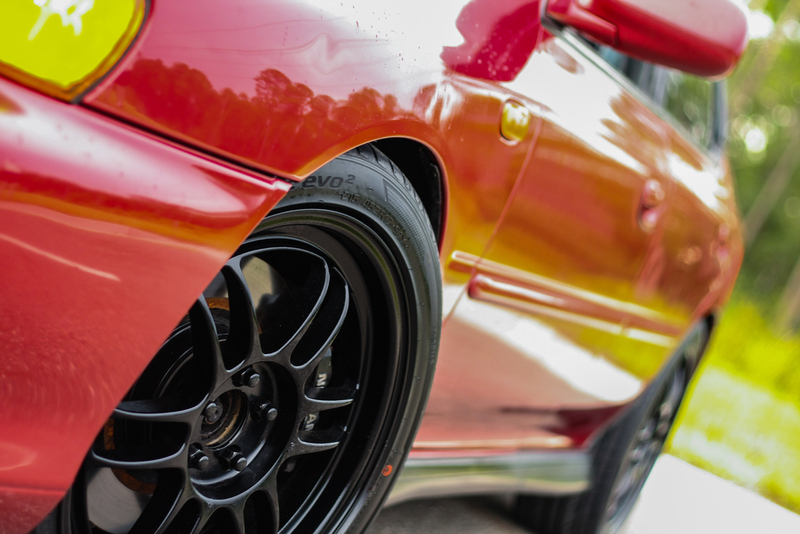 The power that we also know and love is routed to the four corners through Comp Stage 2 clutch which grips an STI 6 speed manual. The half dozen cogs are selected via a Cobb short shifter capped by an STI piston shift knob. No STI 6 speed install would be worthwhile if it eliminated Subaru’s Driver Controlled Center Diff feature, so a MapDCCD controller was added. This allows selection of one of my favorite adjustments: the aggression setting - or what percentage of the power makes it through the 1999 RS Automatic driveshaft, to the GD WRX R160 rear differential. The other interior additions also follow the “function first” mantra. Corbeau Forza seats and a Corbeau harness hug the front occupants. A bugeye WRX auxiliary gauge pack relays vital information to the driver. Matt’s short term plan for the car is to run the car more frequently in autocross events. Long term, he says he would like to build the short block to be able to “beat on it more and not worry about it.” He says he enjoys “attending NFSG meets and events. It has also been a great way to meet new people and start new friendships.” With all the great people in the group, it’s an easy thing to do. Thanks again to Matt and everyone who voted. Stay tuned to the group page for October’s entry post.